The Adam Sandler/Drew Barrymore film The Wedding Singer was a surprise hit in 1998. Its stage adaptation landed on Broadway in 2006 and was less so, running for just 284 performances – quite respectable 40 years ago, but much less than stellar with current Broadway economics. The show was hailed as generally appealing, but ultimately derivative and slightly bland. The not at all bland staging of The Wedding Singer at the Old Log suggests that the Broadway version’s director simply didn’t have things calibrated right. 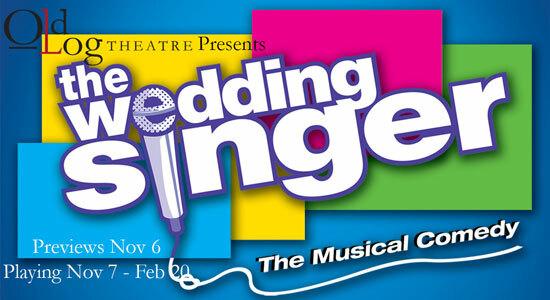 The ostensible lead, Eric Morris, takes center stage at the top of the show as the eponymous wedding singer Robbie Hart. Morris is charismatic and sings well, but quickly has to share the spotlight with some equally talented costars. Elizabeth Anderson (Julia Sullivan) is alluring to listen to and watch, and Philip C. Matthews (Glen Guglia) starts out the second act with a bang with an engaging, powerhouse delivery of “All About the Green.” The rest of the cast is not bad and the dancing is superb; you might just want to stay for drinks after to chat about the show.